Clarity in Clutter???? How can anyone see or feel anything but overwhelm and a mess when they look at clutter?? Going through the de-clutter process can be very freeing. It is like a physical weight has been lifted off your body. While you go through your clutter, piece by piece, bit by bit, you become very clear about what you want to surround yourself with and what you value in your life. Clutter clearing is an extremely psychological process and not only will the clutter clear physically but you will see clutter falling away emotionally. It is amazing the avenues that clutter clogs and the avenues that are opened up, in your physical space and in your mind, when that clutter is no longer around. 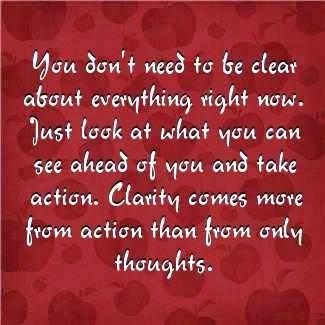 You don’t have to be clear about everything right now but the more action you take to clear the clutter from your space and mind, the more clarity you will have.